On a cold, wet, dreary day at the start of November, I dragged myself out of bed and took the tube down to Holloway Road. With no coat and no umbrella I started the short walk from Holloway Tube Station to Jenius Social where I had booked myself on to the Pimp My Profiteroles Masterclass! But let’s start at the beginning. Jenius Social is a new North London food hub which aims to be a fresh destination to greet, meet and eat connecting foodies of all levels from beginner to gourmand. They host a whole range of events and masterclasses and with the wide variety of topics and foods covered there’s sure to be something to interest everyone. I for one spent ages on their website trying to decide which class to pick! Founder and owner Jen (or Jennifer Yong) has a real passion for food which really shows. Jen has teamed up with a wide range of partners to provide classes covering sausages, patisserie, Malaysian street food and more from the clean and modern cookery school based just off of Holloway Road. How did I find out about Jenius Social? I stumbled across Jenius Social via Edible Experiences when I was looking for cookery schools that offered gift vouchers with the intention of giving one to my Dad for Christmas. I’d given myself a £50 limit but knew it would be difficult to find a cookery school where this covered the cost of a whole class. With that in mind, I was ecstatic when I discovered just how reasonably priced Jenuis Social was – if anything it’s incredibly cheap! Cookery schools in London in my experience cost almost double what Jenius Social were offering. With that in mind I wanted to check the place out before getting a gift voucher for my Dad and booked myself on to Pimp My Profiteroles! The Pimp My Profiteroles Masterclass is (or at least was) led by Andrew, one of Jamie’s original 15 apprentices in his restaurant aptly named Fifteen. working with chocolate, presentation skills, flavour combinations and piping. The real reason I was going was to learn about choux pastry. I have only ever tried making it once, when I was 11 and it ended disastrously. Needless to say I’ve been too scared to give it a go ever since. The first half of the class went really quickly. Before we knew it we had trays and trays of profiteroles headed for the oven. 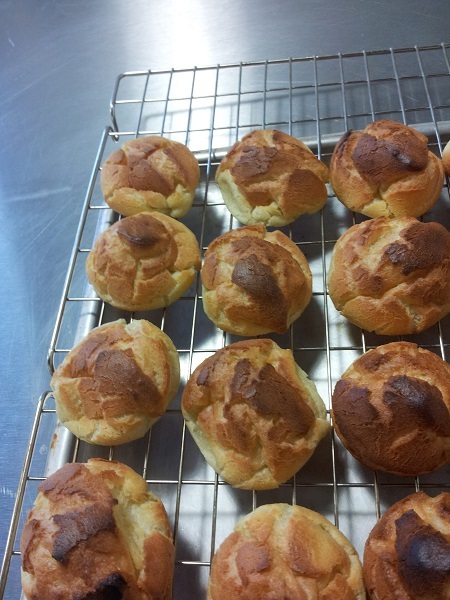 Just 12 minutes later the golden, puffed up choux buns were out on the cooling rack. Blueberry & Star Anise Compote. Once they had cooled down we pumped them full of the crème anglaise and started dipping, pipping and covering the profiteroles in the hundred of sprinkles and toppings provided. Two hours later I had a huge box of profiteroles to take home that were not only technically pretty good (even if I do say so myself), but original, creative and most importantly delicious. The class isn’t really the kind where you can sit down after and eat everything you’ve made (as nice as it is to sit and socialise at the end of a class). 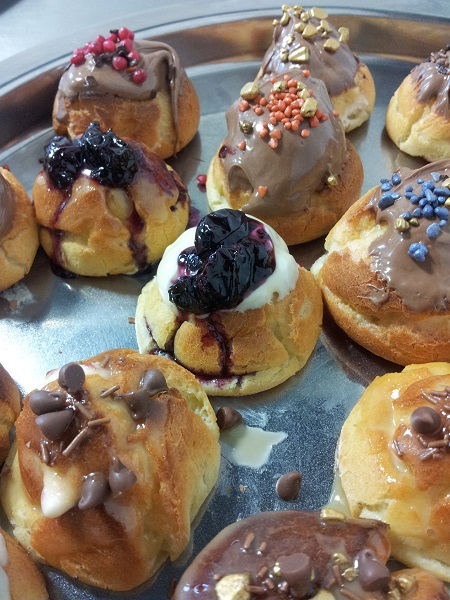 So, Jen kindly provided a box for my profiteroles and tubs for the extra sauce so I could take them home to share. I had such positive comments from my profiteroles and I enjoyed myself thoroughly so I would be foolish not to go back! 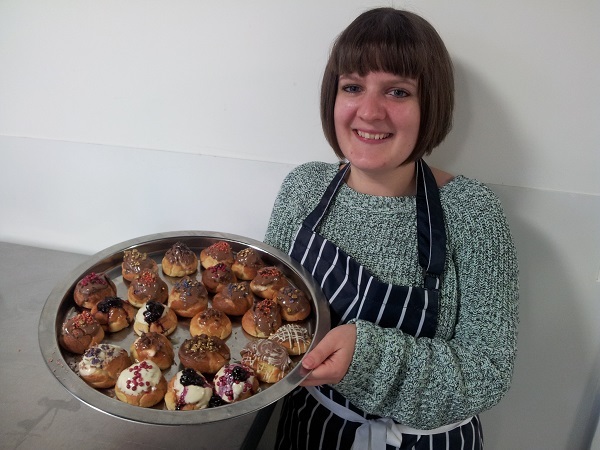 So there it is, an affordable cookery class – you can thank me for finding it with profiteroles after the class. 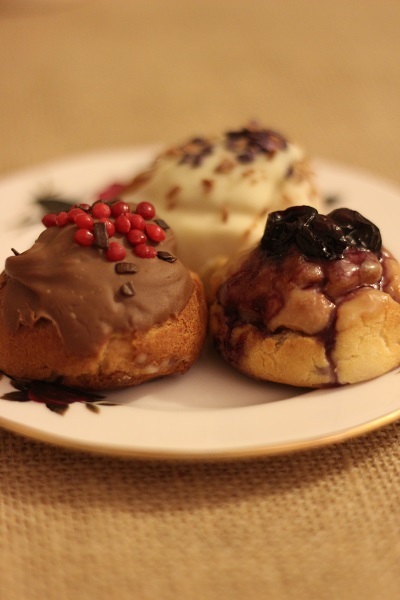 Learning to make profiteroles is one of my 2015 food goals! Well actually it’s to make a croquembouche so I figured I should probably know how to make the building blocks of it… wonder if the class is still on?! Hey Connnie! This class would be perfect for you, and yep it’s still on 🙂 I was planning a croque en bouche styled into a Christmas tree back in December but never got round to it 🙁 hey ho, there is always next year!